My friend Mike and I have been getting together to do some tag team crafting to make this Coraline doll (inspired by the recent stop motion movie) for our friend's birthday! Since we gave it to her today I can finally post some pictures of it! I won't lie it's been pretty hard sitting on these photos to not ruin the surprise. Really cool, you did a spot on job! This turned out really fantastic The face is just perfect, I love the expression. This further inspires my desire to make the knit squid from Coraline. Which I've seen twice. In 3D. "I'm goin' to hugga your face!" "Knitting is a boon for those of us who are easily bored. I take my knitting everywhere to take the edge off of moments that would otherwise drive me stark raving mad"
omg its so perfect! gimmmmie! I absolutely love the doll! I saw this movie in 3D and it was so much fun! It looks fantastic? I was wondering if you could tell me how big the doll is and what the head is sculpted out of? Thanks everybody, glad you all like it! 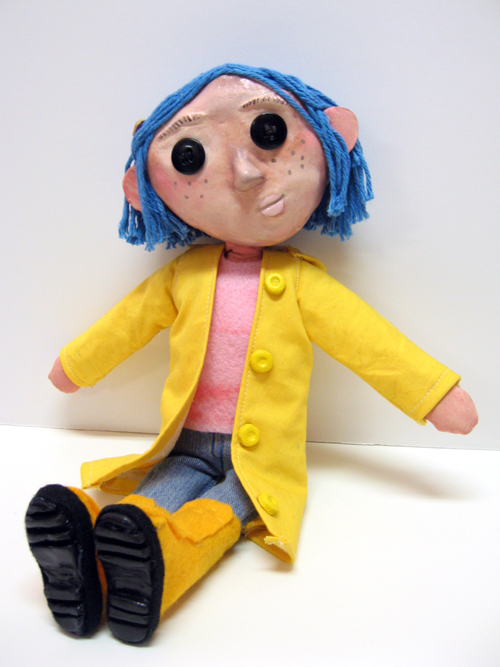 Ohhh....I am so dying for a Coraline doll of my own! This looks fantastic!